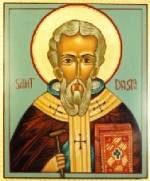 Saint Dunstan grew up under the influence of a special role model - his uncle was the Archbishop of Canterbury. As a young man, he mastered the arts of metalworks and scribe. As an adult, he became an abbot at Glastonbury. By this time in history, the English monasteries were fading as a result of the onslaught and devastation brought about by the Viking invasions. Dunstan, knowing the value of the monastic life, took it upon himself to reestablish monasteries and interest in the monastic life throughout England. At the request of King Edgar, Saint Dunstan returned home to become Archbishop of Canterbury. Continuing his mission work, Saint Dunstan established many new churches and revived the arts of illuminating Church manuscripts, devotional metalworks, and hymnal music.